The dreaded Christmas food shop is nearly upon us. No one like wrestling for a turkey in the chilled aisle the day before Christmas Eve and then ending up with a rubbish one. Maybe it’s time to opt for an online Christmas food shop. Supermarkets are now making it easier to shop online by offering incentives for first time shoppers and using AI to build recommender services to speed up your shopping. Not only is the festive season manic in the shops, but behind the scenes in warehouses, the influx of orders means that staff are inundated with packing, shipping, and restocking shelves. These tasks are time consuming and require a lot of manpower! Ocado, UK’s largest online-only supermarket, are working to make this exhaustive task far more efficient and have created a robot that is capable of putting orders of 50 groceries in baskets in just five minutes, a task that can take human workers up to two hours. 1000 robot helpers are Ocado’s ‘only way to handle large orders’ which are coming in thick and fast over the Christmas period. The robot knows exactly where to find your turkey, cranberry sauce and Christmas pudding as it navigates its way through the warehouse which has been segmented into sections based on storage temperatures, based on a grid system. These robots aren’t entirely replacing the human workforce in the warehouse - once the robot has located the items, grabbed them with a hook, and zoomed back through the warehouse (at four metres per second) the items are delivered to a human to pack into their delivery box. Paul Clarke, Director of Technology at Ocado shared with RE•WORK at the IoT Summit that there are two massive technology tsunamis they're working through - ‘the Internet of Things and Smart Machines. Their collision with each other and us, is going to generate huge new opportunities in areas as diverse as healthcare, entertainment, disaster management, smart appliances, smart homes and smart cities.’ He spoke about these opportunities and what Ocado is working on with highly smart, highly automated, highly sensed environments. 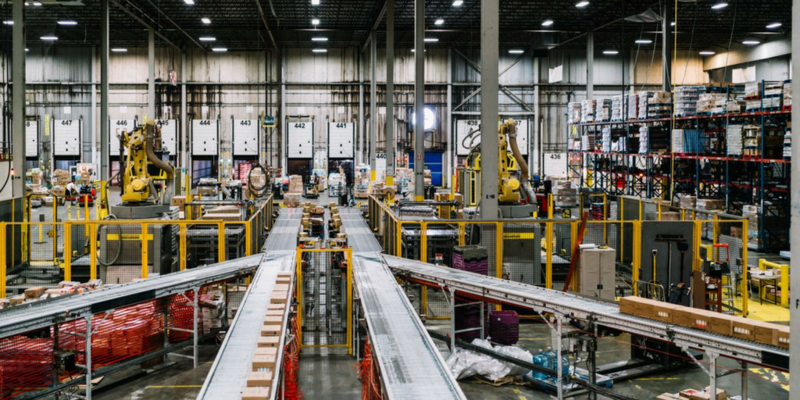 Automation isn’t new to Ocado - they’ve had automated trolleys, a conveyor belt-based system, and they’re constantly investing in improving their software. As well as these robots saving time, they’re also going to be far cheaper in the long run, cutting employee costs and Dan Kara, Research Director of Robotics at ABI Research said that soon these robots ‘will become ubiquitous’. Back in the summer, the retailer sent a self-driving truck through the back streets of Woolwich as part of their trial of autonomous grocery deliveries. Industrial automation and robotics are transforming business practices across multiple industries and are leading to a fourth industrial revolution. Join RE•WORK in San Francisco next June 28 - 29 at the AI in Industrial Automation Summit to learn more about harnessing advancements in AI to increase quality and efficiency in industry.